When it comes to our beloved brown spirit, going big doesn’t have to mean dropping half your tax return on 750 milliliters of the good stuff. Because for every dusty bottle of black market Pappy van Winkle, there’s a whole hoard of ambitious anklebiters ready to flex atop your home bar for a fraction of the price. We enlisted McCarthy’s expert help to compile these 18 readily available picks, each studded with international awards, so you can safely leave those shady Craigslist Pappys for the suckers. 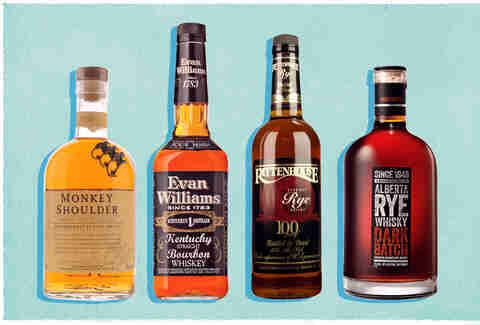 10 Bourbons You Can Afford to Drink Every. Single. Day. “A classic bourbon in the barrel for over two years, 86 proof, tastes exactly what bourbon’s supposed to taste like, and a liter is under 20 bucks,” marvels McCarthy. 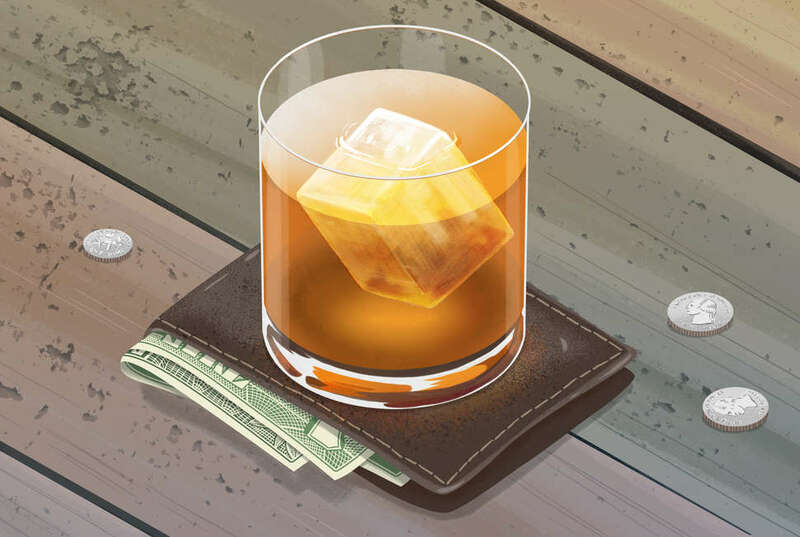 “It’s the perfect well bourbon, quality product at a great price and you can drink it all day.” For such a bargain, it’s smooth as all get out and possesses enough rounded character to stand up tall in cocktails and sing on its own. Reputable single malt peddlers Glenfiddich, Balvenie, and Kininvie come together in beautiful harmony inside this award-winning budget-friendly bottle, resulting in a light Scotch that drinks like boozy cream soda balanced out by earthy malt. In operation since 1946, this proudly Canadian distillery claims to be North America’s biggest rye whiskey producer, with 450,000 barrels sleeping soundly onsite. The Dark Batch proves their prowess, a distinctly mahogany-hued expression layered with 91% peppery rye and 8% bourbon topped off with 1% sherry for a rounded, slightly nutty finish. This lively number, aged on seared French oak, represents Maker’s first major release since they debuted their OG bourbon in 1953. 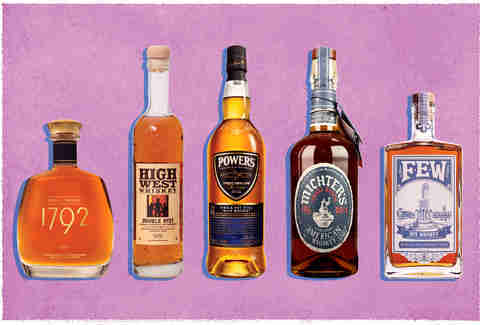 “They took regular Maker’s Mark and added finishing staves that pump up the vanilla and baking spice notes,” McCarthy explains. “And [they] upped the proof to 47 percent, so it’s got some muscle to it.” Nice and toasty, a bit of peach lacing also shows through, making for a solid, easy-drinking sipper with a sophisticated edge. This stalwart selection, based on a recipe dating all the way back to 1870, has garnered a bevy of awards over the years, including a nabbing the Double Gold at the San Francisco World Spirits Competition in 2013 and taking Silver at the 2018 American Whisky Masters. Its bold, spicy opening notes and delicate orange-tinged finish -- not to mention the bargain price tag -- only sweeten the deal. 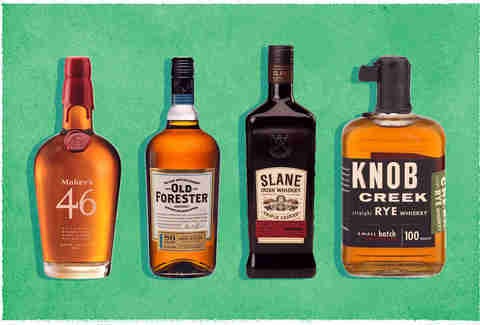 Irish whiskey gets a bad rap sometimes, but as a category it consistently crushes it in blind taste tests so we can probably go ahead and blame the stigma on the Queen. Regardless of anti-Irish sentiment, this relative newcomer breaks from the Jameson-lead pack by aging its warm butterscotch-scented juice in three different barrels: medium char virgin oaks casks, spent bourbon and Tennessee whiskey barrels, and Oloroso sherry butts, which contribute a robust dried fruit and dark chocolate undertone. This badass Utah-born blend of a rugged 2-year-old high-rye and a more mature 16-year-old expression literally explodes with flavor (OK, not literally, but you know what we mean). Pink peppercorns, anise, cinnamon, and a strong minty hit of clove ride in on a silky vanilla and caramel wave with each full-bodied sip. Not for the faint of palate. Another formidable contender from the Emerald Isle, this trusted brand’s latest single pot still release spends most of its sleepy time in spent bourbon barrels before getting dosed with a touch of Oloroso sherry-aged whiskey to smooth things over. Toasty on the nose with juicy, citrusy notes and nicely spiced finish, it’s a tad more complex than the original but just as satisfying. A gold medalist at the 2017 World Whiskies Awards, this 125 proof Southern stunner is arguably the best bourbon you can get for under 50 big ones. Its depth of flavor alone -- wafts of cigar smoke interspersed with vanilla, burnt caramel, brown butter, and cinnamon -- is worth every damn penny, while the creamy mouthfeel keeps you thirsting for more. Aged in spent bourbon barrels as opposed to freshly-charred new oak, this celebrated Kentucky charmer sets itself apart from its woody, syrupy brethren with a markedly fruity flavor and a mellower, more subdued body that really lets the juice sing. A burst of spearmint and butterscotch washed over by caramel sweetness and a dash of nutty coffee make this a warm weather drinker’s dream. It might not be the cheapest bottle on the shelf, but this multi-award-winning expression, with its incredibly complex balance of orchard fruit, brown sugar, and spiced orange peel coasting down a buttery rye thoroughfare, is a definite must-have. Fun fact: FEW’s name is a cheeky nod to Francis E. Willard, an icon of the Temperance (AKA anti-alcohol) Movement and native of the distillery’s own Evanston, Illinois, known as the birthplace of Prohibition. Take that, Franny. This cult favorite sherry bomb picked up the gold at the 2017 San Francisco World Spirits Competition and for good reason -- the finely composed single malt is aged to sweet, full-bodied perfection in a combination of Spanish Pedro Ximenez and Oloroso casks. “The influence of the sherry cask aging is more pronounced than what you’d find in, for example, Macallan 12 Year,” notes McCarthy. Luxuriously creamy with a pinch of stone fruit and drying ginger, it’s fireside ready at all times. 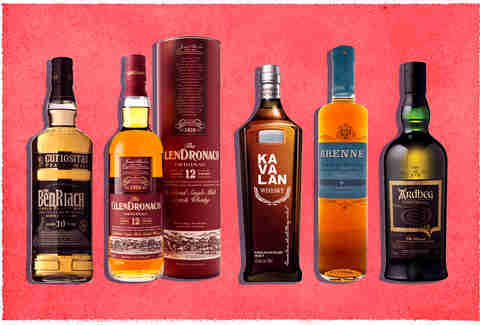 “Kavalan, out of Taiwan, is making some really elegant, sophisticated whiskies,” McCarthy says. While most of this polished fleet sports top shelf prices to go along with their top shelf pedigree, this entry level, cocktail-friendly expression provides all the tropical bang for less of the buck. The island’s balmy climate accounts for much of the juice’s enticingly fruit-forward aroma, which is backed up by rich praline, dried fruit, and lightly toasted oak on the palate. This unique addition hails from France’s Cognac region and, as one might imagine, carries over some of the profiles found in the area’s beloved spirit, most notably creme brulee, almond, and Bananas Foster thanks to its sojourn inside used Cognac barrels. As if that weren’t enough, a distinctly floral, coconut-laced aroma ensures this is a far cry from anything birthed on American shores. Named World’s Best Single Malt at the 2010 World Whiskies Awards, this Islay smoke machine also racked up a whopping 96 points from Whisky Advocate and has the peat-fueled punch to prove it. “When it comes to Ardbeg, you’ve got to put your seatbelt on and get ready to get funky,” says McCarthy, a self-professed huge fan. “It’s tons of peat, tons of smoke, tons of flavor.” If you like them big, fiery, and full of beef jerky, bitter espresso, and sticky black currant, this’ll give you your money’s worth and then some.